Leatherface doesn't have too many friends. It's easy to see why. He wears a mask made from human hide, he dabbles in cannibalism, and he's always with his crazy murderous family. Help Leatherface out this Halloween by wearing this Classic Leatherface Costume and getting him acquainted with some potential friends. Maybe you can mingle by the hummus and ask people if they want to take turns trying out your chainsaw. Let us know how that goes over! Need to complete your Texas Chainsaw Massacre costume? Then you need something that shows everyone just how crazy you are and a kitchen apron just isn't going to cut it. This Adult Leatherface Butcher's Apron will though. It looks like it's made out real human skin and is enough to make any one of your friends wonder if they're next on the chopping block. Deep in the backwoods of Texas there is an evil, terrible family. This family has been know to take people off the road and make them dinner. Now this isn't to say they would cook for them but instead they would cook them up and eat them. That is what Leatherface has been doing for years. With each victim he has caught he has added to his skin suit and mask. Now you can look just like the Texas terror with this great Chainsaw Massacre costume. If people are going to dress as slasher movie monsters, at least they can be smaller than the rest of us and not make us fear for our lives. Although, should an especially talented kid wear this boys Leatherface costume he will likely still scare the daylights out of us anyway. If you drive too far off down the back roads of Texas you may find one of the worst monsters ever, Leatherface. What makes this murderous madman the worst is that he is completely human and does the worst things ever to others. So when you hear a chainsaw roar while you're in the Lone Star State be sure to run away from it right away or you'll end up a part of a Texas chainsaw massacre.Now your little one can be their favorite horror movie maniac in this great Leatherface costume. Just be sure to pick up one of our chainsaws to complete the costume. Become a horror movie ghoul that won't die with this deluxe Leatherface mask. 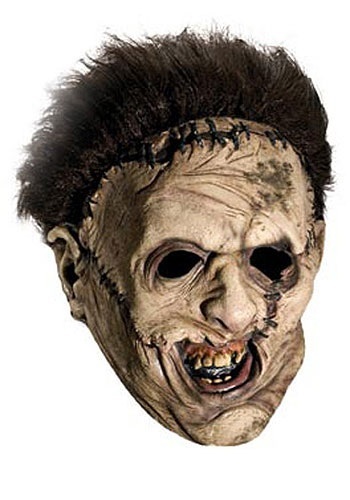 A must have for Texas Chainsaw Massacre fans, this licensed replica is sure to get a few screams out of your friends. Just because he hasn't seen The Texas Chainsaw Massacre yet doesn't mean he doesn't get big ideas when it comes to wearing blood and guts to make himself look scary. This Leatherface Apron turns any outfit into a scary outfit, but probably won't cause the nightmares that would come with watching the film it is inspired by. Using this Leatherface Red Chainsaw Accessory as a costume prop is a much safer alternative to lugging around a real chainsaw. It makes realistic sounds, so it will still scare your friends and family when you pair it with your Texas Chainsaw Massacre costume, but it won't get you in trouble with any local police like a real chainsaw will!